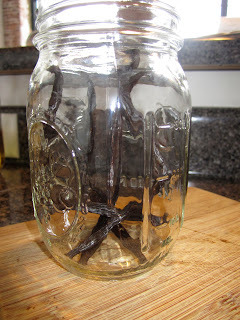 So, I have decided that I am going to start making my own vanilla extract. I had no idea how simple it was until I started researching the subject. 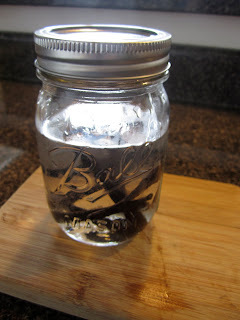 There are two ingredients- vodka and vanilla beans. Now that's my kind of recipe. Yes, I am using Burnett's vodka. This is a great way to get rid of that cheap vodka you've got lingering in your liquor cabinet. I had some left over cheap vodka from my college years and was happy to get rid of it. The finished product on day one. As the months go by, the color will get darker and darker. 3 Give the bottle a good shake every once in a while. Store in a dark, cool place for about a month. This is said to last for years. You can keep topping it off with vodka once in a while as you use it, just remember to give it a good shake. You can also make vanilla sugar by putting a split vanilla bean into a jar of white, granulated sugar. It can be used for baking, and I think it would be great for putting a sugared rim on cocktail glasses. I'll be using that when I make sangria this summer.